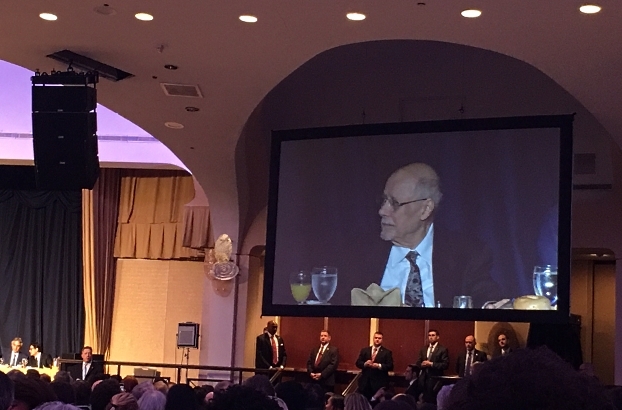 The National Prayer Breakfast is an annual event of such high profile that it draws nearly all the members of the House and the Senate, Cabinet members, world political and religious leaders and international industry tycoons. And this year, CIU Director Rabbi Bemporad was invited to read from Scripture at the beginning of the event, joining President and Michelle Obama, opera star Andrea Bocelli, the Speaker of the House, the Minority Leader, and other top dignitaries at the head table. Held the first Thursday in February at the Washington D.C. Hilton, the National Prayer Breakfast is attended by between 3,500-4,000 representatives of more than 100 nations, and affords participants the opportunity to network and build business, religious, political, and social connections. Established in 1953, it has been attended by every president since Dwight Eisenhower, and for the past four years, by Rabbi Bemporad as well. In addition, Rabbi Bemporad has addressed participants at the International Luncheon twice, (held on Wednesday afternoons), one of the many programs of the three-day event.